The project was born out of the friendship between a groups of Americans both North and South. The need was obvious but what to do. We thought if we could start with the youngest children, and if we could be there every day, with quality pre-school education and enrichment programs in those important early years of life, we might have a chance to watch at least some of these kids take control of their futures. We hoped that such a program could provide adult role models of successful, happy, productive, caring people ready to meet life’s difficult challenges. Our wish was to sing the songs that children need to hear, to play the music that leaves impressions of a world of goodness and promise. And above all, to provide a safe place for parents to be with their children. If people like us, people living a life of abundance and security, could add to the love given each child by their parents with all the love we could find within ourselves, we might start to see changes for those living in Ciudad Oculta. 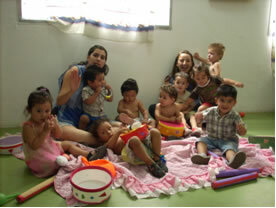 We were moved by the enormous needs of these very young mothers and their children and by the experience and dedication demonstrated by the Buenos Aires team. We had people with solid track records assisting in the founding of drug treatment centers and rural schools, all of which continue serving their communities in Argentina. And regardless of his masters degree, the man who would become the director of the daycare had as his main qualification that he has worked every day of the last 15 years in Ciudad Oculta. In Ciudad Oculta, he is a known and trusted counselor, helper, and friend. Full commitment to the project came after asking all the hard questions, perhaps the same questions you may have. How would the money be used? Who would control funds raised? Would any one be paid for administration or fund raising or take a commission? Who would own the building? Who would actually run the project during construction? Who would lead the daycare? And, what is the team’s background in starting and running projects such as this? The right answers came back. 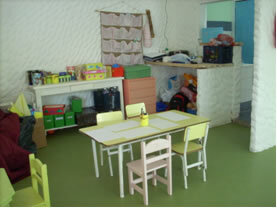 The pledge to raise the first phase of funding to acquire a building for the daycare center was made.